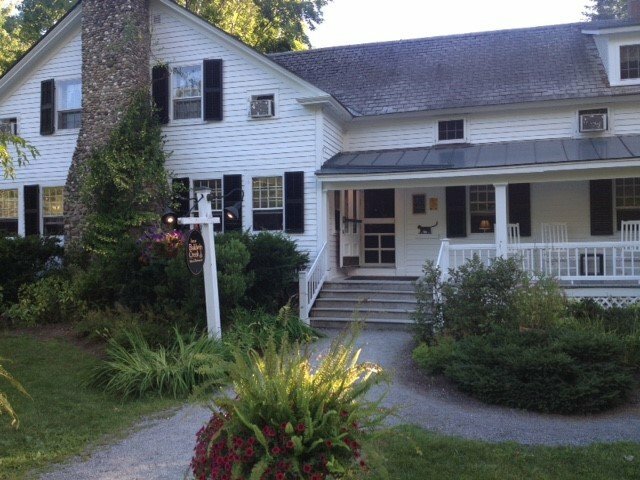 Mary’s Restaurant, located at the Inn at Baldwin Creek in Bristol, Vermont (Addison County) features an eye-catching blurb of approval on its website from Vermont Magazine: “A visit to Vermont and missing Mary’s is like visiting Paris and missing the Eiffel Tower. . .” A proud farm-to-table restaurant since 1983, Mary’s Restaurant sources its food from its own on-site farm as well as other small, local farms. 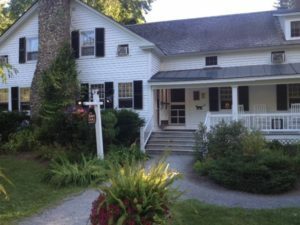 One of the founding members in the mid-90s of the Vermont Fresh Network, this praiseworthy farm-to-table restaurant is also a proud member of Slow Food Vermont and represented Vermont chefs at Slow Food’s Terra Madre conference in Turin, Italy in 2006 and 2010. 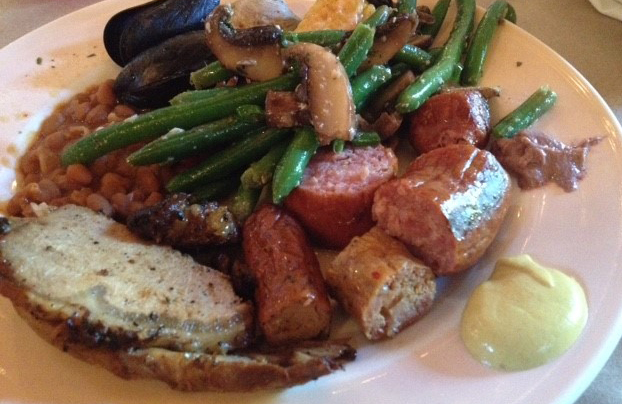 In 2013, Mary’s Restaurant was awarded the coveted Slow Food Snail of Approval designation. Our contributor, Lucas Knapp, had the pleasure of enjoying a late summer pig roast at the Red Barn at Mary’s Restaurant and shared his good fortune to be “a foodie in the Green Mountain State at this bountiful time of year” with his review of this special “happening.” On its website, Mary’s Restaurant has a tab for “Happenings” and upcoming events include Mad River Distillers Cocktail Dinner on Oct. 15 (a four course dinner co-hosted with Neil Goldberg, Mad River Distillers Burlington Tasting Room Manager with each course featuring a different Mad River cocktail) and Pie Cooking Class With Anne Collins, a baker and cookbook author, on Nov. 5. 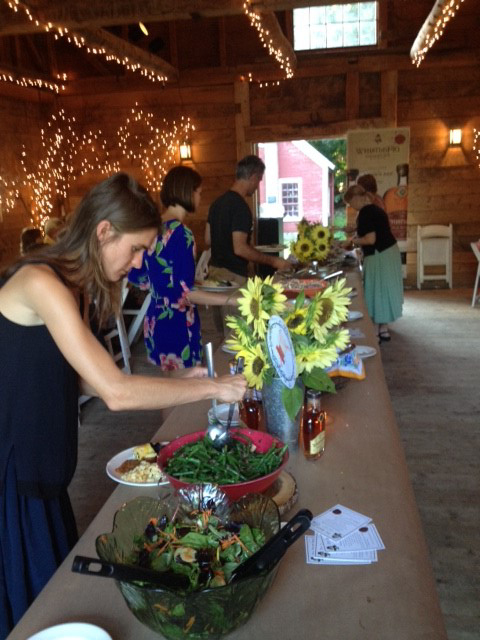 The Barn at the the Colonial-style Inn at Baldwin Creek, home to Mary’s Restaurant, was the perfect location for a farm-to-table buffet featuring a roasted pig from Whistlepig Farm in Shoreham, VT and a complementary whiskey tasting. And what a delightful pig roast it was! 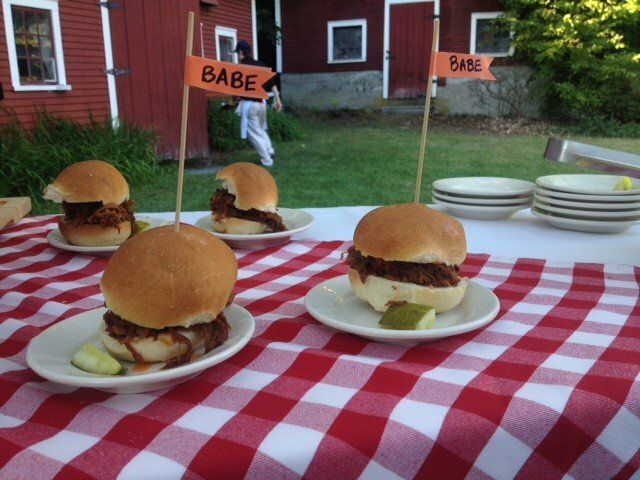 Pulled pork sandwiches and sparkling house-made sodas greeted us along with the friendly event coordinator, who pointed us toward the barn buffet and bar with a smile. My partner assisted early-on in the whiskey tasting by enjoying a splash in her soda. She also received a trio of coins for the complementary whiskey cocktails to come, each featuring WhistlePig 10 rye whiskey: Philadelphia Fish House Punch, combining dark rum, cognac, peach brandy, lemon-oleo-saccharum (oil extracted from citrus peel), black tea, lemon, and pineapple; Burning Down the House, with Mad River Distillers vanilla rum, dark rum, ginger liqueur, lemon, watermelon juice, black tea, and simple syrup; Alexander at Your Service, the bartender’s clever take on a Brandy Alexander layering WhistlePig’s rye with cognac, crème de cocoa, and vanilla bean-cinnamon infused milk. The drinks were enticing even for a non-whiskey drinker! Not to be distracted, we made our way to our seats so as to dig into the pulled pork sandwiches stacked high on mini brioche buns and accompanied by a little pickle spear. The barn was set up for a feast. One long table ran the length of the left wall, and several round tables lined the right. In the middle lay a buffet complete with a clambake, featuring local Vermont crawfish from the Vermont Crawfish Co. in Rutland, VT and Wellfleet Shellfish Co. clams and mussels, a generous platter of grilled sausages and scrumptious mustards, steaming mac n’ cheese, buttery cornbread, sweet and salty baked beans, crispy coleslaw, salad with fresh garden greens from Mary’s on-site farm, grilled chicken, and, of course, slices of spit-roasted pig. 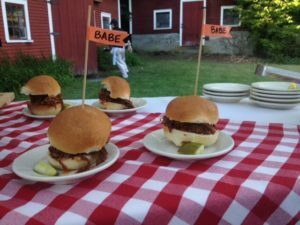 We savored the pulled pork sandwiches before grabbing fresh plates and piling them up with our choice selections. My favorite were the sausages: a variety of plump, juicy wursts, kielbasas, and other North Country Smokehouse meats piled high, waiting to be dipped into the tangy mustards alongside—one yellow, one purple, both delicious! The dinner smorgasbord was followed by a generous portion of Summer Berry Shortcake, featuring raspberries from Mary’s and blueberries from local farmer Ken Thiebauld. Throughout the evening my partner sampled the drinks, most enjoying the refreshing watermelon of Burning Down the House. WhistlePig’s Steward of the Brand, Larry Swanson, led a game of trivia that left everyone laughing and gave a few folks some fun prizes to take home, not the least of which was a big bottle of maple syrup—Vermont’s most famous and delectable sweet treat. The summers in Vermont are ripe for this sort of shindig. In an area of the Northeast particularly savvy about their local land use, the farm-to-table food movement has been strongly welcomed with the help of places like Mary’s, who regularly patronizes small enterprises like Big Basin Farms (owned by former Mary’s staff Michelle Boucher and Jason Shepard) and Last Resort Farm. I even had the pleasure of dining across from local food entrepreneur, Francie Caccavo of Olivia’s Croutons, and her friends, whose son we had met at The Stampede, a local fundraiser for cystic fibrosis.